Jul. 18, 2017 1:30 a.m.
Kristin Reynolds arrived in Prince George in the early hours Sunday morning, with her two dogs Tweeks and Fraser, as many items from around her house she could grab and one pair of flip flops. But don’t expect her to complain about it. “I think I’ve got it pretty good, like a lot better than a lot of other people,” she said outside the Emergency Operations Centre at the College of New Caledonia. Admittedly still riding the wave of adrenaline that activates when one is thrown into chaos and nights of unrest, Reynolds is making a home away from home in a donated tent with enough room for her two loyal companions and the few mementos she could grab in the dark. Spent last 24 hrs talking to countless #BCWildfires evacuees in #CityOfPG 1 said happy/sad comes in & out as she "grieves having no control"
Reynolds received the “time to leave” knock on the door of her and her husband’s “retirement home” in Horsefly at about 9:30 p.m.
See, living off the grid means that when it’s dark outside, it’s dark inside, Reynolds explained. You can walk into a room, pass a pile of important items and just completely forget about it, but grab useless junk – which may have had something to do with why she has a few empty canvases and markers in her trunk. The first night – refusing to let her dogs out of her sight – she slept in the passenger seat of her four-door car parked in one of the campus parking lots while her dogs got fresh air outside on two long leashes. 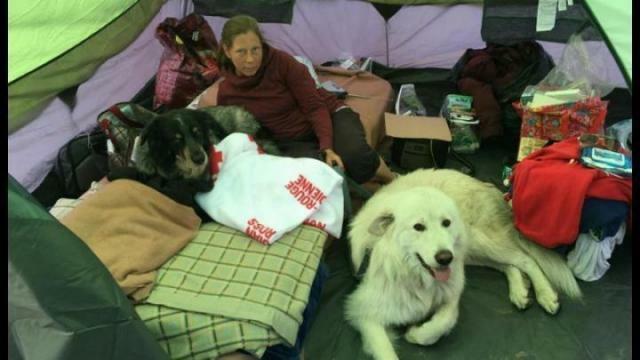 By the second night, she was sleeping inside a donated tent, matched with a donated mattress and a Canadian Red Cross fleece blanket. She’s made her space dog-proof, with a little fence to keep Fraser and Tweeks from exploring the town she hopes she doesn’t have to stay in for too long. And although she’s doing the best to make the four-person tent feel as much like a home as possible – even getting acquainted with her neighbours – being without her husband, who stayed in Williams Lake working, in a tent setup on a mix of gravel and concrete was not where she thought she’d be this week. Among random mementos, too much clothes and a bunch of things that are absolutely useless inside her tent, it’s a little radio that’s keeping her sane. While the radio got her through the nights, it’s the people of Prince George that get her through the day. The kindness takes her mind off what she left behind: a house purchased with their life savings and no insurance, her pig named Dotty and her cows. There’s also the looming unknown of when and if she’ll get to go home. Questions no one can give any sort of answers to – no fault of their own, she said. Having neighbours who have been living in the parking lot for more than 10 days, Reynolds is remaining positive.